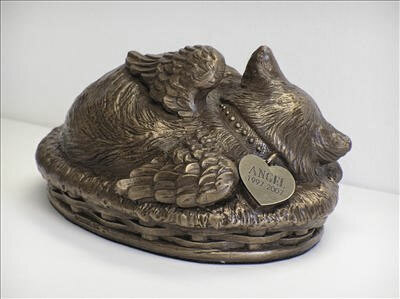 Our Angel Winged Kitty Urn - Bronze depicts a sweet cat sleeping cozily in a basket. The cat is intricately detailed, using the traditional cold cast process. Crafting the urn with cultured bronze, a composite of resin and bronze particles, creates the look and feel of bronze but without the exorbitant price of a solid bronze sculpture. Optional engraving is available on a heart shaped brass colored tag with a peal-off sticky back so you can attach it to the urn. Please limit name to no more than 10 letters and dates to years only. The urn is bottom loading with a 2.5" opening and seals with a plastic plug. Felt covers the bottom of the urn to protect the surface on which it rests. Approximate measurements are 7" x 5" x 4" (25 cubic inches).